The peacock television network (also known as NBC) has announced that they are planning to air a reality TV show centered on infomercial self-help guru Anthony Robbins. The program is being created by the producers of The Biggest Loser. 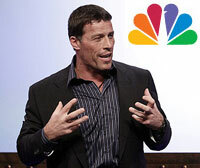 The show Breakthrough with Tony Robbins will bring the world the spectacle of motivational speaker Anthony Robbins barging in to the lives of various sad sacks and telling them how to change their pathetic existences. I have seen the people who Tony helped on the show and this is guaranteed to bring you to tears. Not tears of sadness, but tears of joy as Tony helps lift people from the depths of despair to a life of hope and meaning. This is one of the rare shows that upbuilds rather that tears down. Tony rambles on TOO much, he talks, talks and talks. With that said, I will keep this short: Tony is a mass-marketer who is probably paid a large sum of money. Get out of here, Tony! Tony certainly knows how to tug at the old heart strings. There are many people who claim that Tony has helped them and they owe their lives to his advice and exhortations. You know what, that’s great. I wouldn’t begrudge them a second of their happiness, and if they credit Robbins for it, then more power to them, and to him. I’d rather their lives be back on track, than they be a bunch of moaning losers and sad sacks, living on welfare and addicted to drugs. Having said that, Robbins’ product is not for me. People who deal with Tony are NOT losers as some of the above people have implied and said straightforward. They are everyday people who are committed to bring their lives to the next level and are willing to step outside the social norms which hinder most people from doing anything that is considered cultural unacceptable and weird. It takes massive courage to truly be honest with yourself and admit your life is not where you know it should be, much less admit it to another person and ask for assistance from those who you can learn from. This takes overcoming the immense sense of pride and the idea to always appear invulnerable that this society has created in or mind. True courage is being honest with yourself at the deepest level, not making up stories why everyone else is wrong and your right, especially when they have the kind of life you secretly admire. Fear of not being enough and being wrong keeps people from avoiding contact with the truth. The truth you don’t want to hear is often the truth that will set you free. By mocking people who find true purpose again in life through means such as seminars, or “gurus” (I hate that term) by calling them pathetic or those who should be on drugs, you instantly make it OK to be closed minded. The best way to grow in any aspect of your life is to learn from those that have mastered those areas. I bet those people that made those disparaging comments either got led astray once or knows someone that did and said never again, or the idea that they don’t have it all figured it in life as well as the idea of change scares them to death that they cannot entertain the notion for anyone. Well said Martin, thank you. I can’t wait to watch Tony in action again. I attended his seminar back in 1992 and did not know that after 5 hours we were expected to do the fire walk. I did not believe I could do it because years ago I had suffered 3rd degree burns on my feet. I was a baton twirler in high school and was rehearsing with the band during the summer. I had flip flops on and one of them busted while marching on the boiling hot pavement. This is the kind of pain you NEVER forget. There were approximately 1000 of us at the Hilton Hotel @ LAX and he told us to take off our shoes & socks and walk up to the roof of the Hotel where 12 lines of fire coals were waiting. I went through the motions fearing I would quit just before walking over the red hot coals and just hoped for a miracle. I was one of the lucky ones. Tony was at the front of my line and when it was my turn to walk, he asked me: “Are you ready?” (how can you tell Tony no?). He said “Just repeat: COOL MOSS…COOL MOSS”. Well, the drumbeats synchronized with my heart and I looked up to the starry sky and DID IT!! After they threw cold water at my feet, I ran to the back of the line again to do it again because I didn’t believe I had done it. He was RIGHT!! Thank you Tony. I have seen Tony live in Orlando. I find he is the greatest life coach of my lifetime. I will be glued to the tv for this one and my wife and I rarely watch tv. The show debuted in July 2010 and, not surprisingly, was cancelled after two episode.